May is not only a time of year when homebuyers flood the market to buy the home of their dreams, but also a good time to get started on those needed remodeling projects. What better way to ready yourself for National Home Improvement Month than to take some advice from professionals. If you plan on selling your home soon, or even down the line, we suggests enhancing your home’s curb appeal. Exterior improvements, such as new roofing or siding, and interior upgrades, including new kitchen tile or paint, can make your home look more modern and sophisticated, the source says. Energy-efficient home improvements are also a good project to work on. Installing Energy Star approved appliances can not only make your home more eco-friendly, but also give you some home savings in the long-run. Additionally, conducting some renovations in high-use areas of your home, such as your bathrooms and kitchen, can add new life to a stale or dated design. Consider changing faucets for newer models, adding in new countertops or installing new cabinets. While completing remodel projects, we were faced with the same dilemma. Locate and install the perfect framed mirror to comlpete the remodel. Due to cost and inability to find the perfect size, our clients were forced to install an unsightly frameless mirror. We also quickly realized, existing home owners with frameless mirrors were out of options. Most homeowners did not want to tackle tearing out an existing mirror, repairing the drywall, painting touchups and then locating the perfect sized framed mirror. All of these reasons were not cost effective. This led us to start offering Mirror Mate. With over 65 styles to choose from, this product is The Solution to your Frameless Mirror. Mirror Mate frames your existing mirrors with decorative frames. Your mirror does not have to be removed, no mess or tear out needed. This is a cost effective way to update, enhance and transform those large mirrors in your bathrooms. 1. Turn off the lights you need to clean, and allow the bulbs to cool down before taking them out. Incandescent bulbs generate a lot of heat and can be harmful to touch. Compact fluorescent lights, on the other hand, are significantly cooler than incandescent bulbs, shortening the time you have to wait before you can hold them. 2. When the bulbs have cooled down, use a step ladder and unscrew them with your hands. For fixtures with a narrow trim, this could be difficult. In this case, you can use a light bulb changing tool, which is a pole that features an adjustable grasping mechanism on its end and allows you to get into the trim with ease. 3. In lieu of a changing tool, you can use a strip of duct tape and fold it back onto itself so that it creates a handle, with the adhesive side exposed. Insert your fingers through the opening and press your knuckles firmly onto the light bulb. The duct tape will stick to the bulb, after which you can unscrew it from the trim. 4. Wipe the bulbs with a damp cloth and alternately rub them with a dry one. Leave them out to dry completely before screwing them back into the fixture. 5. 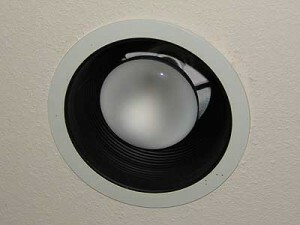 With the bulbs still out of the socket, wipe off dust and grime in the interior of the fixture. Unless the main power line has been turned off, never use a wet cloth in doing this, as it could lead to electrocution. When both the fixture and bulbs are fully dry, screw the lights bulb in. Recessed lights, especially in the kitchen, should always be bright to ensure that tasks such as preparing meals and cooking are done more efficiently. Give the fixtures a thorough clean-up every once in a while to keep them in brilliant condition.